GE Intelligent Platforms have announced the IMP3A, a 3U CompactPCI single board computer featuring the latest dual core QorIQprocessor technology from Freescale. The IMP3A takes advantage of the QorIQ P2020 processor to deliver dual core performance in a single core power envelope: the P2020 offers superior power consumption/heat dissipation compared to previous generations of high performance Power Architecture processors, making it ideally suited to small form factors such as 3U CompactPCI. By coupling the P2020 with an extensive range of memory resources and I/O features, and implementing new features such as SATA and NAND Flash memory, the IMP3A offers innovative technologies for programs committed to the 3U CompactPCI architecture as well as a highly cost-effective technology insertion opportunity for GE’s existing IMP1A/IMP2A customers. A typical application would see the IMP3A deployed as part of a control system onboard a tank, armored vehicle or helicopter. 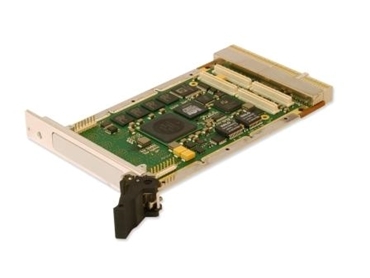 3U CompactPCI has traditionally been a highly attractive architecture for military and aerospace customers because it allows for smaller systems without compromising backplane performance. Availability of the IMP3A single board computers will make it even more attractive, potentially allowing for 2x the performance from a single slot or allowing a slot to be freed up because two single board computers are no longer required: this reduces the cost of the system while increasing its reliability. The IMP3A single board computers support a choice of either the QorIQ P2010 single core processor or the QorIQ P2020 dual core processor, operating at up to 1.2GHz. Both symmetric and asymmetric processing are supported, enabling customers to scale performance through either thread-level or application-level parallelism. A PCI-X PMC expansion capability enables customers to configure the IMP3A to their requirements without exceeding the capacity of a single CompactPCI slot. The IMP3A single board computer is available in five build levels from office/benign to conduction-cooled with a maximum operating temperature of +85 degrees C, and support is planned for popular real time operating systems including VxWorks, INTEGRITY and LynxOS.